This past weekend, I shot in my second registered IBS benchrest match. I shot a match last month with my varmint gun and did pretty well but quickly realized that I was at a serious disadvantage. You can read more about that experience in the 6BR article that is also on the site. I received my used benchrest gun that I purchased off of the classifieds at www.benchrest.com from a gentleman by the name of Bill Cook. It so happens that Bill is also a small caliber enthusiast that shares a lot of similar interests. I received the gun the week after the May Bridgeville match and had 3 weeks to prepare for the June match, which was held this past weekend. I had been to the range only twice with the gun to develop a load, but had been given invaluable information from Bill about the loads that he found to be effective. Stock: McMillan Fiberglass Black and White Marble finish. Gunsmith: Ron Hoehn has fit the last two barrels but I dont know who the original gunsmith of the gun was. Load Data: 28.3 grains of n133 (OO lot), 65 grain Gentner bullet, Lapua cases. In the 2 trips to the range, the largest group that I was able to shoot measured just over .3" and the smallest measured .14". My friend Craig Kostyshyn who has helped shorten the learning curve shot a group that measured .12" with the gun but I didnt shoot it and wont take credit for it. Craig is my benchrest mentor and has helped me along plenty. To ensure that I would have plenty of time at the match, I preloaded all of my rounds the night before the match. I have 80 cases for this barrel that were loaded for this shoot. I figured on 10 during the open range and 10 for each round including the warm-up. That would expend 70 rounds and leave me an extra 10 for breathing room. I actually left the match with 19 unfired rounds. We got caught in stand-still traffic and were considering going across the grass median and turning around to find a back way around the traffic. All of the traffic was trying to get to the Nascar race in Dover, and we needed to get to the other side of Dover. Just when Craig was scoping out the best place to drive across the median the truck (Dodge 4x4) in front of us went across the median and buried the front 2 tires in the wet drainage ditch. We tried to help him get out for about 15 minutes but had to get to the range. We picked out a better crossing point and got across the median without any problem. We got directions from a local at an archery shop and got around the traffic and to the range. We showed up at the range at 10:15 with the match start time of 11:00 and the open range time of 10:00. We were able to set up our flags in a hurry and take a few shots. I was thankful that I had prepared for the match by loading in advance, because we were extremely rushed to get everything ready. I fired 8 shots during the open range to verify my zero and get a feel for the wind that was apparent. The wind was 10 15 mph from left to right. My point of impact at the range the week before was a little left, which turned out to be perfect when holding for the left to right wind. I was able to hold on the left side(9:00) of the 10 ring most of the day. At times when the wind was not as strong, I could hold dead center on the dot (x). With the 8 shots that I fired during the open range, they were all in the 10 ring and I felt confident with my point of aim. I had set a personal goal for this match to shoot a 245 or better the strong wind made me hedge on my initial goal of shooting a clean 250 round. With the 233 score from the last match and the fact that nobody finished clean, I didnt want to set an unrealistic goal. During the warm-up round I shot a clean 50 and had 1x. I felt confident going in to the first round and shot a clean 50 with 1x. In the second round, I shot a clean 50 with a 4x. I followed that up in the third round with another 50 and 4x. In the fourth round, I shot a perfect target with a 50 and 5x. Going into the last round, I knew that I had to shoot clean and was reminded by a couple of shooters that I might get my first 250 sticker. I was a little nervous and let one slip a little farther than I would have liked but it still cleanly broke the 10 ring. I took a couple more shots at the sighter to give me a chance to calm down and then finished the 3 remaining targets when my chosen condition arrived. I finished the final target with a 50 and 3x. My total score for the day was a clean 250 with 17xs. I had demolished my highest expectations. During the match, I had not watched the scoreboard but had only gotten my targets and checked my scores. After the match I was on the last relay, somebody told me that I had finished in 2nd place. I looked at the board while Craig was adding up the scores and it seemed that I had indeed finished in 2nd. After the clean-up, all of the shooters gathered around Bill Truitt (match director) to get the final standings and to hand out the plaques and 250 stickers. Bill announced the 3rd place shooter and then announced the 2nd place shooter as Craig (my mentor) with a 250 15x. Craig spoke up and said that I had shot 17x and that I should have been the 2nd place finisher. They went back to the score sheets and realized that they had made a mistake. Craig finished in 3rd place with 15xs. This is Craigs 2nd straight top 3 finish. 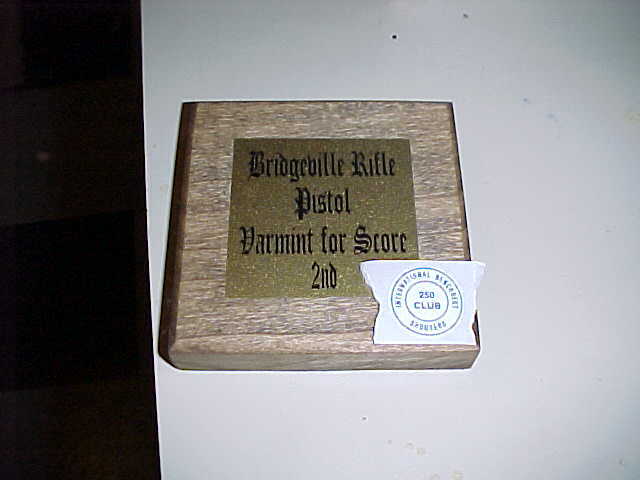 The following is a post that Bill Truitt made on the www.benchrest.com message board after the match. The only mistake to the post was that I was using a used gun but I dont think a new gun would have shot any better. Bridgeville stormed by New blood. Posted by bill truitt on Sunday, 3 June 2001, at 8:48 p.m. The following are the results from the match that was sent to me by Bill Truitt. There was an equipment list at the bottom for the top 3 shooters that I have deleted because of some formatting difficulties.